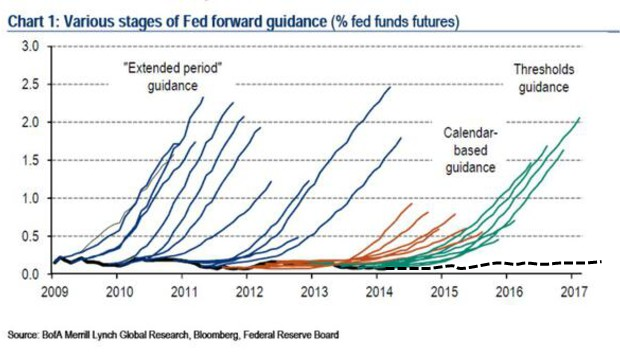 The Fed is effectively in watch-and-wait mode. The reduction in the bond program was widely expected by investors before the meeting and represents a continuation of the policy strategy laid out by Fed Chairwoman Janet Yellen and former Chairman Ben Bernanke in the past few months. The Fed also stuck to its guidance on short-term interest rates, saying they would remain near zero long after the bond program ends later this year. Many investors don’t expect the Fed to start raising interest rates until well into next year. Still, officials nodded to signs of improvement in economic activity in March and April, suggesting they aren’t too worried about the winter slowdown. Of course, overall growth is made up of the growth of its components—consumption, investment, and net imports. It is also important to remember that the subpar growth over the last five years has occurred at the same time that unprecedented monetary and fiscal stimulus has been applied to support the economy. However, since the end of last year, both fiscal and monetary stimulus is being withdrawn. Notwithstanding optimistic forecasts of 3 percent growth starting at the middle of this year, it remains to be seen how robust growth can be without the help of the extraordinary monetary(!) and fiscal stimulus that has characterized the last half-decade. How come there has been “extraordinary monetary stimulus” if nominal spending is so far below trend and it´s growth anemic? Many economists believe the first-quarter pullback was a temporary speed bump. They expect demand that slowed in the winter to accelerate later in the year. With reductions in the bond-buying program on course, Fed officials appear to be focusing on longer-run issues that they need to resolve this year, in advance of any shifts on interest rates down the line. That includes making decisions about whether to continue to target an overnight interbank lending rate called the federal funds rate. The Federal Reserve Bank of New York has been experimenting with a program that could lead to a new short-term interest rate target called a reverse repo rate that could be easier to manage. Moreover, officials need to update an easy-money exit strategy they laid out three years ago that many officials see as out of date. When will they give up targeting interest rates? I know it´s only the preliminary report and will be subject to revisions. But most headlines were quick to blame the harsh winter weather, acting to reduce supply, for the dismal output performance. Also, most analyses detail the positive and negative contributions of the GDP components, but there´s no mention of the fact that nominal spending (NGDP) tumbled from a 4.2% annual rate in Q4 2013 to 1.4% in Q1 2014. And that´s the demand side of the story, manned by Colonel Fed. Let´s see what they have to say later today. In search of a target or of an excuse? In an interview with the Bristol Post newspaper published Tuesday, Mr. Carney declared that “substantial” wage rises will be needed to ensure the economic recovery that began last year is sustained. That is an unusual message for a central banker to deliver. Usually, they warn against large wage rises for fear they will lead to a self-perpetuating inflationary spiral. But Mr. Carney’s comments reflect the fact that central banks across the developed world are facing an unusual challenge, with inflation rates too low rather than too high. It may also mark an evolution in his thinking about how to assess spare capacity in the economy. Under Mr. Carney’s leadership, the BOE in August delivered “forward guidance” to the effect that it wouldn’t consider a rate hike until the unemployment rate hit 7%. As that way station was approached, in February it altered that guidance to refer more broadly to spare capacity in the economy, with Mr. Carney noting that there were other forms of labor market slack, such as workers not being able to put in as many hours as they would like to. Carney’s remarks reflect an increasing focus on wages in policy circles. Two former Bank of England officials who are based at U.S. institutions have recently urged the Federal Reserve to focus on evidence of wage gains rather than falling unemployment as a sign the economy is improving enough to start raising interest rates. From our perspective, thresholds exhaust the guidance options available to a central bank operating under flexible inflation targeting. If yet further stimulus were required, the policy framework itself would likely have to be changed.19For example, adopting a nominal GDP (NGDP)-level target could in many respects be more powerful than employing thresholds under flexible inflation targeting. This is because doing so would add “history dependence” to monetary policy. Under NGDP targeting, bygones are not bygones and the central bank is compelled to make up for past misses on the path of nominal GDP. Pity that once you become a central banker you´re “baptized” in the “interest rate altar”. If people in your office seem to be tingling with excitement this week, it is probably because of all the big economic news on the way. The two biggest regular United States economic reports are scheduled to come out, with first-quarter gross domestic product on tap for Wednesday and April jobs numbers out on Friday. Federal Reserve policy makers are meeting Tuesday and Wednesday for one of their regular sessions to set the nation’s monetary policy. And a variety of other important data releases are coming, including personal income and spending, manufacturing and home prices. What, no tingling? You’re not alone. Because as important as all that stuff is, it is substantially less important, and less interesting, than it has been any time in the last seven years. The economy has gotten boring, and that’s fantastic news — even if it would be even better news if that underlying growth path were a bit stronger. So why do I take this consistency as such good news, even though it is slower than the kind of growth that would rapidly return the nation to a position of full economic health? Because it is a sign that the nation has gotten out of crisis mode. No longer does another downturn seem to lurk around every corner. Corporate executives have spent the last several years complaining about uncertainty hanging around the economy. Now the economy — and business confidence — seems to take even potentially damaging episodes, like the government shutdown last October, in stride. While 3 or 4 percent growth would be better, steady repair of the economy beats a return of a boom-bust cycle that might have accompanied a quicker recovery, particularly if it had been driven by a return to bubble-era housing construction. My take is different. “Deep holes” have been dug in employment and output and we´re just too “content” to go out and work to “fill them up”! Both Ben S. Bernanke and Milton Friedman are economists who studied the Great Depression closely. Indeed, Bernanke admits that his intense interest in that event was inspired by reading Milton Friedman and Anna Jacobson Schwartz’s Monetary History of the United States, 1867–1960 (1963). Bernanke agrees with Friedman that what made the Great Depression truly great rather than just a garden-variety depression was the series of banking panics that began nearly a year after the stock-market crash of October 1929. And both agree that the Federal Reserve (the Fed) was the primary culprit by failing to offset, if not by initiating, that economic cataclysm within the United States. As Bernanke, while still only a member of the Fed’s board of governors, said in an address at a ninetieth-birthday celebration for Friedman: “I would like to say to Milton and Anna: Regarding the Great Depression. You’re right, we did it. We’re very sorry. But thanks to you, we won’t do it again” (2002b). This seeming similarity, however, disguises significant differences in Friedman’s and Bernanke’s approaches to financial crises, differences that have played an enormous yet rarely noticed role in the recent financial crisis. Not only have those differences resulted in another Fed failure—not quite as serious as the one during the Great Depression, to be sure, yet serious enough—but they have also resulted in a dramatic transformation of the Fed’s role in the economy. Bernanke has so expanded the Fed’s discretionary actions beyond merely controlling the money stock that it has become a gigantic, financial central planner. In short, despite Bernanke’s promise, the Fed did do it again. …But can we depend in the future on always having someone of impeccable integrity at the Fed´s helm, someone who will steadfastly insulate this enhanced intimacy with the US economy from politics and corruption? U .S. monetary policy has been remarkably successful during Alan Greenspan’s 121/2 years as Federal Reserve chairman. But although President Clinton yesterday reappointed the 73-year-old Mr. Greenspan to a new term ending in 2004, the chairman will not be around forever. To ensure that monetary policy stays on track after Mr. Greenspan, the Fed should be thinking through its approach to monetary policy now. The Fed needs an approach that consolidates the gains of the Greenspan years and ensures that those successful policies will continue even if future Fed chairmen are less skillful or less committed to price stability than Mr. Greenspan has been. 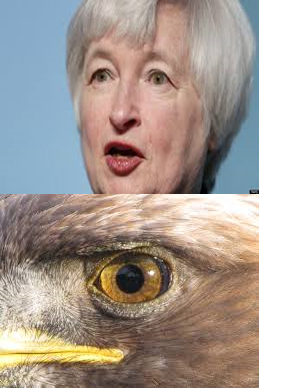 What will Yellen be “committed” to? The FOMC meeting this week is not likely to see any policy fireworks, but it will mark the departure of Governor Jeremy Stein, who returns to academic life at Harvard at the end of May. He has only been on the Board for two years, but he has made an intellectual mark in a critical area where leading members of the FOMC have been largely silent – how to set monetary policy when the need to maintain financial stability is conflicting with the near term outlook for inflation and employment. The issue can be simply stated: should the Fed tighten policy solely because they are worried about the emergence of bubbles in asset prices? Macro-prudential measures may not be sufficient to handle all circumstances, mainly because parts of the financial system are unregulated. There is a long history of direct controls being avoided by aggressive financial institutions, working “off balance sheet”. Therefore higher interest rates may be needed to supplement these macro-prudential measures, because they “get in all the cracks” of the financial system. This raises the paradoxical possibility that an early tightening in monetary policy might actually reduce not only the variability of unemployment in the future, but its average level as well. This is not so crazy. If the Fed had raised interest rates more aggressively in 2002-06, the financial crash, and the current level of unemployment, might have been less severe. We may not be there yet in the current cycle, but we soon could be. When your argument appeals to the interest rates stayed “too low for too long” in 2002-06 it is a sure sign you have a losing argument. I have also commented on the Swedish case here. Update: Don´t miss Mark Sadowski ‘guest post’ in the comments below! The pattern of optimism giving way to dull reality is a familiar one for observers of U.S. markets. Just check out this great chart from analysts at Bank of America Merrill Lynch, courtesy of Saxo Bank A/S chief economist Steen Jakobsen. Each colored line shows the expected path of short-term interest rates — a decent proxy for the state of the economy — while the black line along the bottom shows what has actually happened. For the past five years, traders have consistently (and wrongly) bet that growth is about to accelerate and interest rates will rise. In other words, irrational exuberance lives. If interest rates and stocks finally do go up, it probably won’t be until everyone has stopped expecting it. So what have traders done? They appear to be ‘adapting’, becoming less optimistic as time goes by. For example, in 2010 they expected that by the next year, 2011, the FF rate would be just as high, or higher, than what in 2014 they only expect will happen in 2017! Maybe sooner rather than later expectations will adapt to the point that there will no longer be any future rising line, with only the black ‘horizontal’ line remaining and extending into ‘infinity’. When that happens the ‘construction’ of the “Great Stagnation” will be complete and expectations will finally become rational! According to Jürgen Stark, a former board member of the European Central Bank (ECB), it is not just “misguided” but “irresponsible” to be warning about the threat of deflation in Europe. Instead, he invites us to shut up about it altogether, for “the longer this discussion continues, and the more intense it becomes, the more likely the risk of a self-fulfilling prophecy”. Let’s just close down the debate, he seems to be saying, because we policy-makers know better. The evidence of the past three years, it has to be said, strongly suggests otherwise. While European policy-makers remain trapped in arguments over who pays for failed banks and insolvent states, the real problem of how to get credit and growth going again is left unaddressed. And Europe’s elite wonders why populist parties are doing so well. Monetary economics may be a complex and somewhat technical subject, but it seems that ordinary voters get the gist of it rather better than their rulers. According to my friend Stan Fischer said two things. First, Fischer had warned that what was underway in the global financial markets and the global economy would become very bad. In that sense Fischer rightly ‘predicted’ the crisis. Second, and more importantly in my view Fischer had demonstrated just how well he understand monetary theory and policy. Hence, my friend had asked how it would be possible to offset an external (demand) shock to the the Israel if interest rates would drop to zero. That´s quite true. 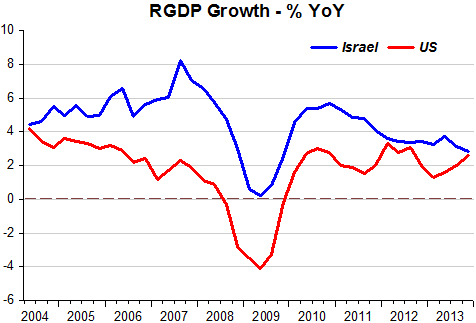 The charts show both Israel´s and US NGDP and Trend. 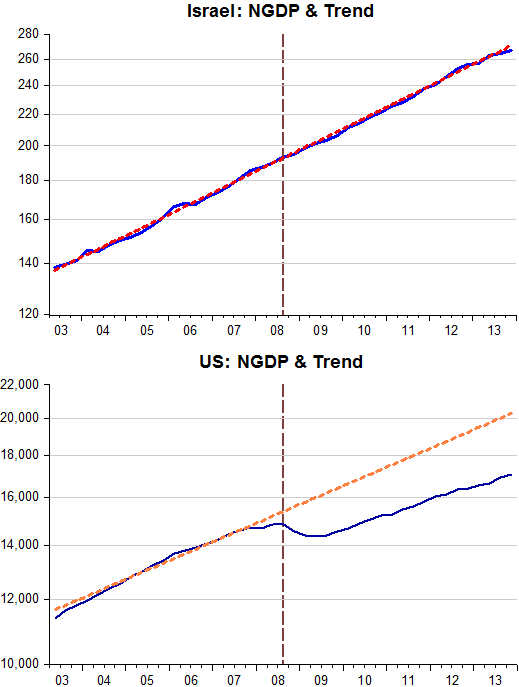 While in the US NGDP tanked in 2008, in Israel it continued along the original trend level path. The different reaction of each Central Bank to the oil shock explains the different outcomes. While an oil shock (a negative supply shock) increases inflation and reduces growth, those effects tend to be temporary and the best monetary policy can do is to keep nominal spending close to trend. 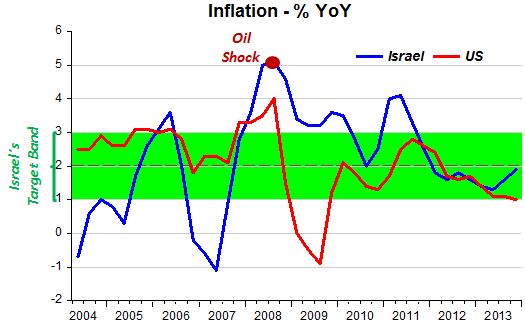 The charts show that by doing exactly that Israel avoided the real output contraction that befell the US. In my work as a central banker, I have made much use of my knowledge of central banking history around the world. Many of the events that are taking place today remind me of events from the past, and knowing the lessons from the past helps us develop policy in the present. A prominent example of this is that of Ben Bernanke, who learned the lessons and the mistakes in handling the Great Depression of the 1930s during his research, and knew how to deal with the most recent financial crisis differently and more efficiently than how they tried to handle the situation in the 1930s. We, the central bankers, thought at the outset of the crisis that we were about to experience another great depression like in the 1930s, when the unemployment rate in the US reached 25 percent. I am not here to claim that the current situation is good, but during the current crisis, US unemployment rate hit 10 percent and then began to decline, and I am sure that the situation would have been very different had Bernanke not acted according to the knowledge that he acquired in the course of his research. Maybe he thinks inflation, output gaps and natural rates are precisely defined and known! Prime Minister Benjamin Netanyahu’s choice for the next Bank of Israel governor has withdrawn his candidacy for the post, after an investigation was opened into an alleged 2006 shoplifting affair at the Hong Kong airport. In an interview with Channel 2 on Monday, Frenkel lamented that despite his willingness to set his own plans aside and “lend a hand” by accepting the post of the central bank’s governor, he has become the subject of slanderous accusations. “We were both formerly central bankers and I personally can say I wouldn’t want to be a central banker today, with interest rates at rock bottom, because there’s almost nothing that can be done,” Frenkel observed. Every central banker knows that keeping interest rates that low isn’t sustainable, he added: “That doesn’t mean it’s a bad policy, but that’s not a place anybody would want to be.” The Bank of Israel lending rate is now at 1.25%, not quite rock bottom but certainly very low. No one can say luck doesn´t exist! To try to illustrate the connection between the markets and NGDP I have constructed a very simple index to track market expectations of future NGDP. I have only used two market indicators – a dollar index and the S&P500. I constructed an index based on these two indicators – I have looked at year over year percentage change in both indices. I have standardized the indices and deducted them from each other – remember higher S&P500 means higher NGDP, but a stronger dollar (a higher USD index) means lower NGDP. I call this index the NGDP Market Indicator. My indicator is only a slight modification from the one Lars constructed. 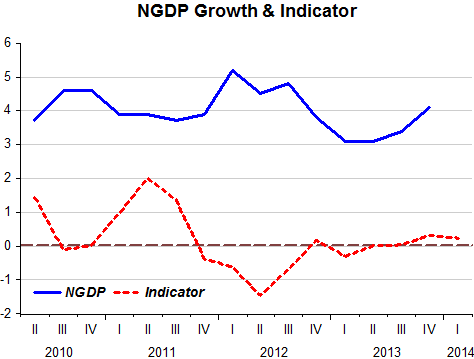 The chart below spans the period from 1990Q1 to 2014Q1 (NGDP is available to 2013Q4). The next chart shows only the more recent period. 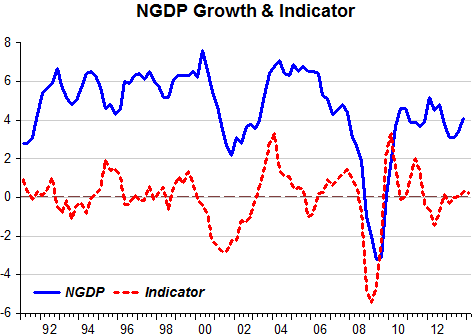 What the indicator appears to be telling us is that NGDP is likely to remain growing close to 4% (YoY). This is why the notion of a “Great Moderation 2.0” is being widely discussed. Unfortunately, people are discarding the level of NGDP too quickly and saying this is the “new normal” or “Great Stagnation”. But the “Great Moderation 1.0” was the combination of both a stable NGDP growth rate AND an appropriate level path along which it travelled. At the moment we have only the stable growth. The level path is clearly unsatisfactory; just look at the low employment level and way below target inflation.